Denver is one of the fastest growing cities in the nation with housing and rent prices sky rocketing. While many residents are benefiting from the boom there also many who are suffering from it. A wave of affluent transplants are filling up new apartments, even though rents have risen more than 3 times the national average. Skyrocketing property values are flooding the city with increased tax revenue, yet the city doesn’t have enough affordable housing for those who need it. Meanwhile many current residents are being priced out of the housing market and builders have no incentive to build affordable and low income housing, which is 21,000 units short for what Denver needs. Sign up to be notified of the event info when it goes up. 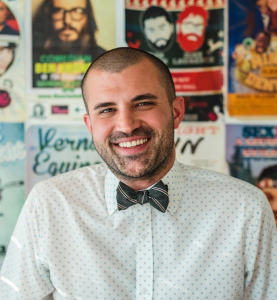 Kayvan Khalatbari is an Iranian-American entrepreneur, advocate, and 2019 mayoral candidate in Denver and is at the forefront of advocacy for Denver’s homeless population. Kayvan Khalatbari has become a vocal leader concerning the topic of homelessness in Denver. A live video he posted to his social media account of Denver Police Department Officers confiscating blankets from homeless people in freezing conditions went viral. Facing pressure from the NAACP and ACLU, Mayor Hancock lifted the “urban camping ban” until April 2017 to get the homeless population through cold winter months. In March 2017, he found success as a principal member of the Alternative Solutions Advocacy Project (ASAP) by helping to get the first tiny-home village for the homeless approved in Denver. Beloved Community Village will be established as a 180-day pilot program for individuals experiencing homelessness to create a democratically self-governed community aimed at self-empowerment and reestablishing lives. The village will consist of 11 houses, showers, restrooms, and a yurt for cooking and village events. Khalatbari’s entrepreneurial, philanthropic, and advocacy efforts have begun to attract positive recognition. He was a finalist for Colorado Biz Magazine’s entrepreneur of the year 2016 and Colorado Business Committee for the Art’s EY Next Wave Leadership Award. What is a Tiny Home Village for the Homeless? Come learn about the Beloved Community Village – the first of its kind in Denver. The village is a self-governed community made of 11 homes, gardens, a shared shower house and common area. You will meet a panel of villagers and organizers with the Colorado Village Collaborative, learn about the next tiny home village and how you could address the current housing crisis by hosting a tiny home village in your community. From our government, to our business, to acts of personal well-being and philanthropy – we are hopefully moving forward to a place of peace! The Public Peace Initiative is working to break down barriers to create opportunities of encouragement, engagement, and action in our communities. CVC exists to initiate and invest in the development of resident-led tiny home villages to address the current housing crisis and produce housing that is affordable, community centric, environmentally friendly, resident-led and easy to build. The collaborative was formed by the Alternative Solutions Advocacy Project in early 2017 with founding board membership from Beloved Community Villagers, Denver Homeless Out Loud, The Interfaith Alliance of Colorado, and Beloved Community Mennonite Church. We have the opportunity as a “Community” to rise up and be a part of the solution. Supporting and hosting a tiny home village in your community can make a huge difference in responding to the crisis. Christine felt stuck as a pet owner unable to benefit from the shelter system. Now she is able to move forward finding safety and employment because of the Beloved Community Village. We will be releasing plans for a village created for women by women. Sign up to be notified of the info when it goes up.